The True 3/8" axles for our Fixed hubs will be available starting on Friday, November 6. They feature an oversized aluminum center female style axle, and your choice of CrMo or Titanium axle bolts. 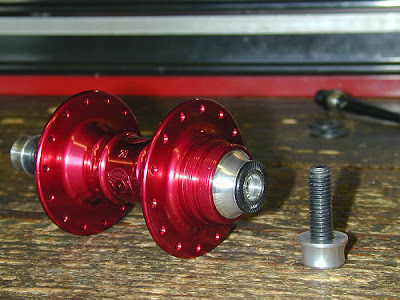 This axle was derived from the axle in our best selling BMX Mini hub, and should make our axles virtually indestructable. The conespacers are made from aluminum, with a knurled hardened steel washer pressed on to bite into your frame. The True 3/8" axles fit into virtually every frame track end that I tried them on, from a Cinelli-Mash Vigorelli to a 1986 Peugeot PX-10. You might need to file your fork dropouts to fit the axle, particularly if you have a lighter fork, but they will fit a Volume, FBM, or Milwaukee fork with no modifications needed. It just depends on the fork- you need an axle slot of about 9.5mm to fit the True 3/8" axles. If you don't know what you're doing, don't file your own fork- take it to a bike shop who does know what they are doing. Trust me. Paying the bike shop 15 dollars is a lot cheaper than paying the hospital to rebuild your face because your dropout snapped off. If you are doing any Fixed Gear Freestyle, these are the hubs for you. If you're a larger rider, or you ride like a larger rider, then these also for you. They are compatible with all Profile Fixed hubs, so you can retrofit them to your hubs if you already ride Profiles. The original axles will still be available for the forseeable future. Pricing will be the same for both axle styles.